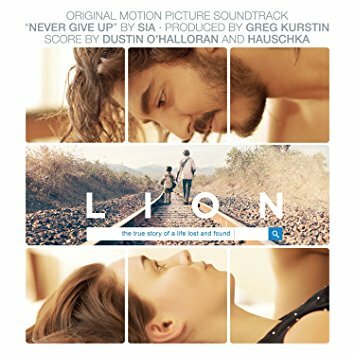 Sony Classical proudly announces the release of "Lion" (Original Motion Picture Soundtrack) with score music by Dustin O'Halloran and Hauschka available digitally Nov. 25 and on CD Dec. 2. The soundtrack also features the exclusive track, "Never Give Up," by SIA, produced by Greg Kurstin, which was especially written for this movie. "Lion" opens in theaters on November 25. Five year old Saroo (Dev Patel of Slumdog Millionaire) gets lost on a train which takes him thousands of miles across India, away from home and family. Saroo must learn to survive alone in Kolkata, before ultimately being adopted by an Australian couple (Nicole Kidman of Moulin Rouge, Australia and David Wenham of Lord of the Rings, Pope Joan). Twenty five years later, armed with only a handful of memories, his unwavering determination, and a revolutionary technology known as Google Earth, he sets out to find his lost family and finally return to his first home. For updates, please visit lionmovie.com/ and facebook.com/LionMovie/. Singer and songwriter Sia Furler has long been known as a hitmaker for the likes of Rihanna and Beyoncé. Although raised in Australia, Furler rose to fame after moving to the U.K., where she was a member of several groups - including the electronica duo Zero 7 – after releasing her first single, "Taken for Granted," in early 2000. Working alongside bassist Sam Dixon over the following years, she boosted her songwriting cred by writing several songs for Christina Aguilera, who put the songs on her 2010 release, Bionic. Sia also continued writing songs for herself, and We Are Born marked her most upbeat album to date. It also went on to become very successful, charting around the world and going to number two in Australia. The next few years she spent out of the spotlight, continuing her parallel career as a backroom songwriter for the likes of Britney Spears, Beyoncé, Celine Dion, and Rihanna, for whom she wrote the worldwide number one smash hit "Diamonds". In 2013, she started on a new album, working once again with producer Greg Kurstin. The album, entitled 1000 Forms of Fear, arrived in July 2014. It promptly hit number one in several countries, including the U.S. and Australia. Furler and Kurstin also reworked existing music and wrote three new songs for the 2014 adaptation of the Broadway musical Annie. One of their new compositions, "Opportunity", was nominated at the 72nd Golden Globe Awards for Best Original Song. At the 77th Annual Grammy Awards, "Chandelier" scored nominations for Record of the Year, Song of the Year, Best Pop Solo Performance, and Best Music Video. Empowered by the acclaim 1000 Forms of Fear earned, Sia began work on its follow-up in early 2015. Later that year, the singles "Alive" - which Furler co-wrote with Adele - and "Bird Set Free" heralded the January 2016 release of This Is Acting, a pop-oriented set of songs. In July, "Cheap Thrills" - the second official single that was originally intended for Rihanna - became Sia's first Billboard 100 chart-topper. For more information on Sia, please visit siamusic.net/. Volker Bertelmann, known as Hauschka, is an independent experimental musician based in Germany who is internationally recognized as a 21st century exponent of prepared piano technique. His playfully repetitive constructs, which certainly reflect the influence of Satie, are also at times reminiscent of early keyboard works by Philip Glass or something from out of the minds of Terry Riley and Steve Reich. Bertelmann's taste for collaboration is again revealed by his project Silfra, which features Hilary Hahn. In 2014 he released his solo album Abandoned City. Based in Berlin and Los Angeles, Dustin O'Halloran scored a number of films and TV shows, including Sofia Coppola's Marie Antoinette and Drake Doremus' Like Crazy. Most recently, he's worked on Transparent, a series created by Jill Soloway for Amazon Studios. In 2015, O'Halloran was awarded an Emmy Award for his original Transparent theme. With A Winged Victory for the Sullen, his project with Adam Wiltzie, O'Halloran has released two albums, A Winged Victory for the Sullen and Atomos. Sony Music Masterworks comprises Masterworks, Sony Classical, OKeh, Portrait, Masterworks Broadway and Flying Buddha imprints. For email updates and information please visit sonymusicmasterworks.com/.